You have added Elysian Dream Embellished Chiffon Designer Dress in Coral into shopping cart. Stunning is the word that best describes this embellished chiffon designer evening dress. You’ll be the best dressed at any event when you show up in the Elysian Dream Embellished Chiffon Designer Dress. This gorgeous dress features a strapless sweetheart neckline and lined and padded bust for support. It is fully lined and made of flowy chiffon. The bust of this dress features pleated chiffon in a criss-cross design and the attached skirt has a full length maxi cut. The best part of this dress is the embellishment at the bust. It features clear rhinestones, silver sequins, and tiny clear seed beads in an intricate pattern. Pictures do this dress no justice—it is stunning in person. This dress has a hidden back zipper and spaghetti straps that can be removed. The Elysian Dream Embellished Chiffon Designer Dress would be perfect paired with strappy metallic heels and a clutch to your next formal dance or black-tie affair. Fit note: This dress runs a bit large; consider sizing down. Details: Fully lined. Hidden back zipper. Lined and padded bust for support. Dry clean only. Size XS measurements: Length from top of bust to hemline: 54”. Bust: 32”. You have added Elysian Dream Embellished Chiffon Designer Dress in Coral into Wishlist. You have added Elysian Dream Embellished Chiffon Designer Dress in Coral for Stock Notification. You have set Elysian Dream Embellished Chiffon Designer Dress in Coral as a loved product. 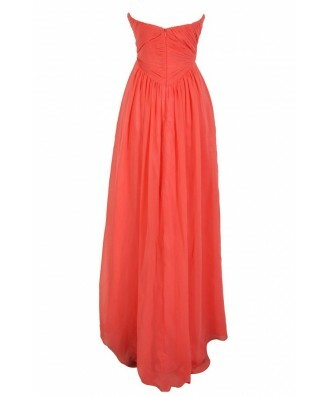 You have removed Elysian Dream Embellished Chiffon Designer Dress in Coral as a loved product.